A former gang leader oversees security at the Good Samaritan Inn in Kingston. Andrew Carter first fired an automatic weapon at the age of 14 when he joined a street gang in Jamaica’s capital, Kingston. He spent the next 15 years talking tough and shooting people as he rose through the ranks to become a leader of a gang engaging in the illegal sales of gasoline and marijuana. Then one evening, several friends were chatting on the porch of Andrew’s house, and one of them accidentally fired an automatic weapon into the roof. Nobody was injured, but the incident scared Andrew’s girlfriend, Annette, who fell out of the bed in fright. She pleaded with Andrew to move to her uncle’s house in another town. Around that time, Andrew’s brother, who was in the same gang, was arrested for murder and received a 20-year sentence. He later died in prison. Andrew decided to start a new life. “I gave it all up when my brother went to prison,” Andrew said in an interview. Andrew and his girlfriend moved to the uncle’s house, and Andrew began to work as a security guard. Several years passed, and Annette left Andrew to marry a man in the United States. Andrew could no longer stay in the uncle’s house, so he moved across the island to another town where several relatives lived. He found a new job as a security guard. His quiet life was shattered in December 2015 when a cousin, speaking in a conversation with friends, inadvertently blurted out his history with gangsters. The news quickly spread through the town. Thirteen armed men marched over to Andrew’s house, scared and determined to kill him. Andrew disdainfully looked out the window at them. “They were simple country people, and I had grown up in a tough, concrete ghetto,” he said. He went to get his guns to shoot them. But Andrew’s sister heard about the standoff, and she rushed over to her brother’s house. She saw the guns and begged him not to shoot anyone. Andrew wanted to protect his family, so he threw some clothes into a backpack and boldly walked out the front door. He wasn’t afraid of the armed men in the street. The armed men watched silently as Andrew walked past. Andrew didn’t say a word to them, either. He had nowhere to go, so he returned to his birthplace, Kingston. 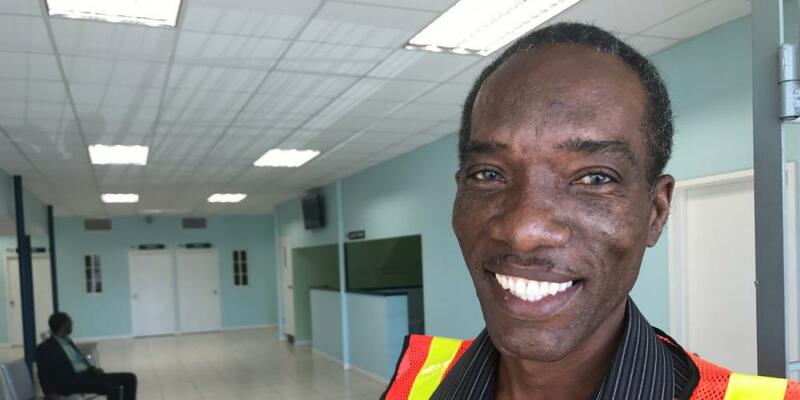 Unable to find work, he slept at a bus station for 2 ½ months. Then one day, another homeless man told him about a place called the Good Samaritan Inn. The man said the community center was run by the Seventh-day Adventist Church and offered free hot meals, a place to bathe and do laundry, and beds to sleep. Andrew couldn’t believe his eyes when he saw a crowd of 300 people lined up to eat at the Good Samaritan Inn. “This is the first time that I had seen people fed like that,” he said. He received a bed at the Good Samaritan Inn, and soon he began working there as a security guard. Later, he took Bible studies, and he was baptized in 2016. Andrew loves working at the Good Samaritan Inn. Andrew has reconnected with his relatives, including a sister and brother who are Adventist. He learned that his mother was baptized into the Adventist Church before dying in 2011. He is now 51 and preparing to get married for the first time. “I am trying to be very faithful and put my trust and faith in God,” he said. Part of the 2015 Thirteenth Sabbath Offering went to refurbish the Good Samaritan Inn in Kingston, Jamaica, and to expand its work to include a free medical and dental center for the homeless. Thank you for helping the Good Samaritan Inn reach out to people like Andrew. Tanzania and Uganda on Fire With 117,000 Baptisms Total Member Involvement evangelism spreads across Africa. 2 Impossible Prayer Requests Lead to Right Wife Inter-European Division president Mario Brito met Maria in Spain but proposed in France.